Prada Phone by LG 3.0 hitting the UK tomorrow | Android Blast! 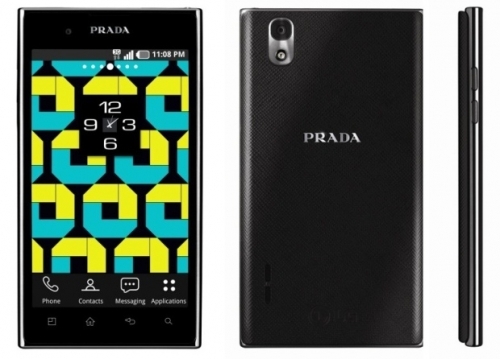 Courtesy of Phones 4u, the Prada Phone by LG 3.0 will hit the UK Friday, January 27, 2012. The high-fashion phone has some decent specs including dual-core processor, 8MP camera, and ultra-bright NOVA display. It runs Android 2.3 Gingerbread, which isn't the latest version of Android, but should receive an update to Ice Cream Sandwich later this year. London, 26.01.12 - Phones 4u is proud to announce that it will be the first retailer in the UK to stock the new PRADA phone by LG 3.0. The first batch of designer PRADA phones will go on sale for the first time in the UK tomorrow, on Friday 27th January. With its sleek black design, unique PRADA customised black, grey and white user interface, and PRADA�s signature Saffiano leather feel back, the PRADA phone by LG 3.0 is every gadget-smitten fashionista�s dream. But what it exudes in style it also oozes in substance. Currently one of the slimmest phones on the smartphone market at 8.5mm, the PRADA phone by LG has a high brightness 800-nit NOVA display to view all those crystal clear photos taken on the 8MP camera. With 1.0GHz Dual-Core/Dual-Channel processor and dual-band Wi-Fi for high-speed performance and internet browsing, it also comes with an internal memory up to 8GB, all wrapped up in a deluxe PRADA branded box with PRADA branded stereo headset included. If you take out a contract on the PRADA phone by LG 3.0 at Phones 4u before the end of February, you�ll also get 12 months free unlimited* 4u Wi-Fi. The new 4u Wi-Fi offering from Phones 4u allows you access to Wi-Fi from your mobile phone whenever you�re in one of The Cloud�s 6000+ hotspots across the UK. What makes 4u Wi-Fi even better is that you only have to register for Wi-Fi access ONCE. Each time you then enter one of The Cloud�s Wi-Fi hotspots, you will be automatically connected to wireless internet. The PRADA phone by LG 3.0 will be available from Phones 4u stores and online FREE from �31 a month on a choice of networks from Friday 27th January. You can watch a hands-on review of the glossy new PRADA phone by LG 3.0 on the Phones 4u website now, and order yours from tomorrow.